Podcasts have taken over as the best way to entertain yourself, and maybe learn something too, during your commute. While podcasting has been around since 2004, it didn’t completely take off until just a few years ago. If you don’t know what a podcast is, they’re audio talk shows or stories that you can download and listen to on your smart phone, computer or tablet. Most podcasts are free, and they cover any subject ranging from TV shows to contracting. 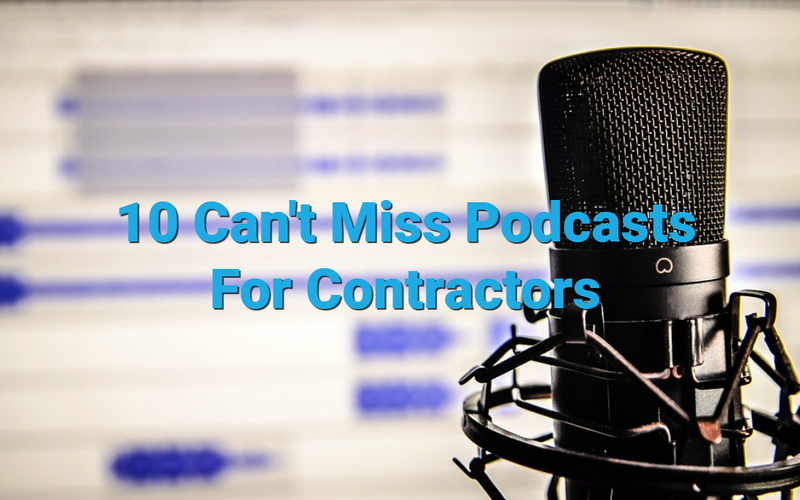 Contractors from any trade will find helpful tips and industry news through these 10 great contractor podcasts. The Protractor podcast labels itself as a podcast by contractors for contractors, and that’s exactly what it’s all about. The host, Martin Holsinger, interviews real contractors working in a variety of positions in the contracting industry. These insightful guests share their stories of how they got into contracting and what they’ve learned through their successes and failures. You can listen to Protractor on iTunes, Google Play and Stitcher. Carpenters, there’s a podcast just for you all about woodworking. Marc Spagnuolo, Shannon Rogers and Matt Cremona host Wood Talk and each give a different point of view on the fun and frustrations of woodworking. Both beginners and experts can learn something new with each episode covering a different woodworking project and answering listener questions. Their conversations are not only educational, but their banter is hilarious. Marc also posts a series of how-to videos on his website The Wood Whisperer. Wood Talk is available on iTunes and Stitcher. Every industry is different, and The Roofer Show gives roofing business owners tips and strategies for building a successful company. Dave Sullivan has been in the roofing industry for over 30 years and he shares advice while interviewing a new roofing business owner each week. This podcast is a roofer’s best resource from people who have been there and experienced both successes and failures. Start growing your business by listening to The Roofer Show on iTunes or Stitcher. Hosted by Jon Workman who brought you the electrician learning website, Electrician’s Library, Stuff Electricians Should Know! is all about providing tools to make you the best electrician you can be. This podcast is useful for keeping up on industry trends and answers to questions that electricians should know. The episodes are never longer than 20 minutes, so it’s the perfect podcast to listen to during a lunch break or during the drive to a job site. Listen now on iTunes, Google Play and Stitcher. Hosts Ralph Wolf and Zack Psioda started HVAC Shop Talk to inform HVAC technicians on news and issues in the HVAC industry. Each week, they debate their opinions on the latest HVAC developments and interview guests. This podcast is a great companion during your work day to keep learning about the ever-changing industry. HVAC Shop Talk is available on iTunes, Stitcher and Google Play. Home renovators and remodelers can find helpful tips through The Property Renovation Podcast hosted by James Woodham. Each episode covers a home remodeling project and features interviews from people who have renovated homes before and builder perspectives. You’ll find episodes covering smaller projects like building shelves to larger whole-room remodeling projects. You can find The Property Renovation Podcast on Stitcher, Google Play and iTunes. Mike Andes talks creating a successful lawn care business from his own experience starting Augusta Lawn Care Services when he was just 18 years old. Landscape Business Course’s 20-minute episodes dive into marketing tactics, equipment, hiring and everything that goes into a landscaping business. You can also take Mike’s online courses if you’re looking to start a landscape business. This podcast is available on iTunes and Stitcher. The Paint Drops and Hops Show isn’t just about painting, but sometimes comedy and random topics too. This hilarious show, hosted by Joel, Bockelmann, Andy and John, reviews the latest painting products and discusses hot topics in the painting industry. You’ll enjoy their witty conversations as they talk about painting while drinking beer. Listen now on Stitcher, Google Play and iTunes. Handymen, and anyone in the blue collar industry, can benefit from the expert advice on The Blue Collar Proud Show. Carter Hawkins and Taylor Hill interview blue collar business owners on topics ranging from marketing your business to hiring the right people. The podcast’s goal is to help trade business owners grow their business on a platform that’s exclusively for blue collar workers. Enjoy weekly episodes on iTunes, Google Play and Stitcher. These 10 podcasts ensure you learn more about your industry from the best. JobFLEX also helps you grow your business by making invoicing and payment easier. Just like podcasts, JobFLEX offers an invoicing app for each specific trade.